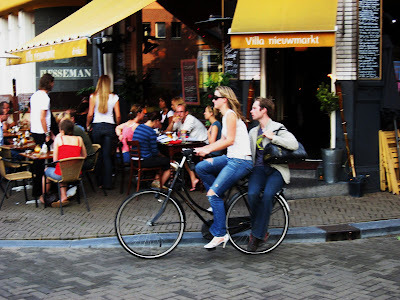 Cycle Chic®: Guest Photos Amsterdam, Vietnam and... Hackney!? Guest Photos Amsterdam, Vietnam and... Hackney!? This great little website is often linked to. A tourist took 82 photos in 73 minutes on a square in Amsterdam. He was amazed at all the bikes. "I snapped this on the streets of Ho Chi Minh City (Saigon) Vietnam, in the spring of 2005. It's a reminder that many people are CycleChic because other options are few. True flower power here! Thanks for all your great photos. Matt." And thanks to you, Matt, for your wonderfully colourful photo. There are two phrases that, until now, have never been uttered in the same breath in the history of man. "Hackney Council" and "Cycle Chic". The East London Borough put on a "Heels & Wheels" fashion show in the historic flower market, touting the bicycle as a fashion accessory. Here's Hackney Council's cycling website. A fine initiative, we say. I love this blog! Just scrolling through your page, I was not only amused, but impressed and encouraged by the photos of women shopping in beautiful clothes while using a bike for transportation! I live in the US, where it is almost unheard of not to use a car for transportation. What a wonderful comment, Di. Thanks for that. You CAN do it in style! Best of luck to you!